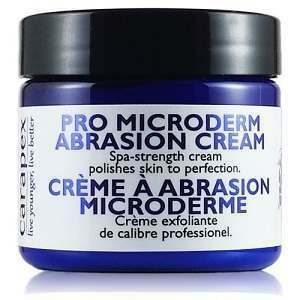 If you are seeking an all in one skincare solution which can exfoliate, moisturize, strengthen, nourish, and repair your skin; all at once, then our Carapex Professional Microdermabrasion skin cream review is certainly worth a read. The Carapex cream claims to cleanse blackheads, and to help colouration and scarring associated with acne and stretch marks. Below we’ve tried to get all of the key information to inform you as much as possible, so please read on for more! Firstly we’d like to make clear what the Carapex product never includes. No chemicals, sulfates, fragrances, or colours are used, and Carapex takes a strong stand against using parabens, fragrances and colouring. There is also absolutely no testing on animals for Carapex products. While the oils and butters are busy adding a hydrating, vitamin rich boost deep into the layers of your skin the aluminium silica crystals gently rub away the surface skin cells, cleaning away pollutants from the pores. Most products you’ll find will need daily (or twice or even thrice daily) application. This isn’t how the Carapex formula works. You are advised to use only once or twice per week, after cleaning the skin thoroughly. The RRP is at $35.99 for a 2 oz / 60 ml tub. This may seem steep compared to the competition, but bear in mind with only one or two weekly applications, it should last for several months. Also some great promotions are regularly available and right now you can pick it up from their site for only $20. Carapex offers absolutely no guarantee, and the way they phrase it is a little disconcerting, including, that they do not guarantee that the product is fit for the purpose it claims. Then again microdermabrasion is relatively new, and we suppose no microderm cream can be guaranteed to work. This is all the more reason that a guarantee would be an incentive if one was thinking of buying this product. The best use for this product seems to be as a two in one exfoliator/microdermabrasion cream, and a moisturiser. The ingredients seem to boast an impressive, effective blend, and the aluminum crystals are the normal ingredient used in microdermabrasion so it seems a safe bet. The guarantee is a problem though, particularly as the phrasing falls in such stark contrast to so many other brands who are willing to promise that their good will work, and if it doesn’t then you can have it for free. Also for this product the price does seem fairly expensive, unfortunately. The ingredients seem to address perhaps the causes of coloration a little, but it doesn’t seem to contain enough active ingredients to protect against future damage, or for the overall health of the deep layers of the skin. David Carney	reviewed Carapex Professional Microdermabrasion Cream	on August 4th	 and gave it a rating of 2.5.